For all intents and purposes, your smartphone and tablet are also handheld gaming systems. Today you can play titles that were once reserved for traditional game consoles on the same device you use for phone calls, Web browsing, social networking and navigation. We’ve come a long way, baby. But there are still some advantages to dedicated gaming handhelds like the Nintendo 3DS and Sony PlayStation Vita — physical controls, for example. And now there’s a new entrant in the field, the Nvidia Shield. The Shield is an Android-based portable game console that features a five-inch touchscreen attached to a game controller. You can use it to play games made for Google’s Android operating system, or you can stream PC games to it (with caveats). It also offers all the features of a tablet running the latest version of Android. To be clear, the Shield is, first and foremost, a gaming device, and it’s a powerful one at that. (If you’re unfamiliar with Nvidia, the company makes the chips that provide the graphics power in many of today’s Android devices and Windows PCs.) I played at least half a dozen games on the Shield, including Grand Theft Auto III and the third-person shooter game Max Payne, and the handheld offered some of the smoothest game play I’ve seen on a mobile device. Graphics looked great on the sharp screen, and sound boomed from powerful speakers. All that said, I wouldn’t recommend the Shield to everyone. For one, it costs $300, which will alienate casual gamers right off the bat. If you’re only playing titles like Angry Birds and Plants vs. Zombies, stick with your smartphone or tablet. Second, as with other Android-based game systems I’ve tested, including the $40 Green Throttle, Shield is limited by its selection of games. 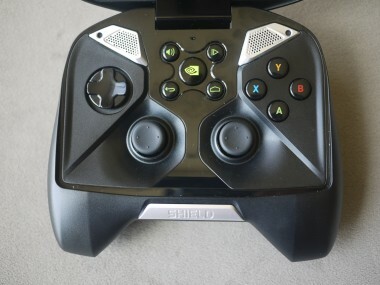 Though you can play any game available in the Google Play Store, only about 100 titles work with the Shield’s controller. 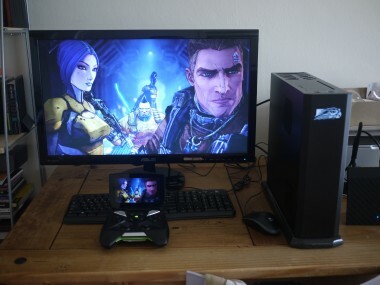 Also, the PC-streaming feature requires that you have a PC equipped with a specific type of Nvidia graphics processor and a high-end wireless router. The game support for this device will likely grow with time. But given the restrictions and its expensive price tag, its appeal will be limited to a small group of hard-core gamers. The best way to describe the Shield’s design is to imagine an Xbox controller with a five-inch touchscreen attached to it. Compared to the Nintendo 3DS and Sony PlayStation Vita, it’s clunky and hefty, weighing in at just over a pound. But the finger grooves and rubberized texture on the bottom of the device make it easier and more comfortable to hold than a full-size tablet when playing games. Of course, the dedicated game controls help, too. Below the display, you’ll find one set of buttons, which includes a directional pad; two joysticks; A, B, X and Y buttons; a shortcut to the Shield game center; and a home button to return to the main Android screen, among others. Along the top edge of the device are a pair of trigger and shoulder buttons, an HDMI port, a MicroUSB connector and headphone jack. When not playing games, you can use some of these controls to navigate through Android’s menus or input text using the onscreen keyboard. But using the joystick to move to different letters and then pressing A to select doesn’t make for efficient typing, so you can use the touchscreen. This isn’t particularly comfortable, either, though, since you have to reach over the control pad to press the screen. For this reason, the Shield doesn’t make for a tablet substitute. But let’s move on to the more exciting things, like game play. Shield comes preloaded with two free games — Sonic 4 Episode II THD and Expendable: Rearmed — but you can download more from the Google Play Store or from the Shield Store. You can access the latter by pressing the Nvidia button in the middle of the control pad, and in the store, you’ll find games that are optimized to be played on the Shield. Currently, there are only about 30 to 40 titles. There’s also a Shield Games section where you’ll find all your downloaded games from the Shield Store, and a section for streaming PC games. I played casual games like Cordy, in which you have to help a cute little robot solve puzzles, and more-intensive shooter games like Shadowgun THD. With each title, I was impressed at how great the graphics looked on the Shield’s 720p HD screen. There weren’t any hiccups in performance, even for the more graphics-heavy games like AVP: Evolution, and the controllers provided much more precision than a smartphone touchscreen. The device’s stereo speakers also pumped out an incredible amount of volume. Compared to smartphone and tablet speakers, the audio was rich, not tinny. While the Shield-optimized games ran great, other titles I downloaded from the Google Play Store didn’t work with the device’s controllers. For example, EA’s Dead Space only worked with the touchscreen. Serious gamers might also lament the lack of top-tier games, though the PC streaming feature might make up for it. It gives you the freedom to keep playing games without being shackled to your desk. But there are a bunch of caveats. First, you have to have a desktop PC equipped with an Nvidia GeForce GTX 650 graphics card or higher, and a dual-band router. If your system doesn’t meet these requirements, then the Shield’s streaming functions are useless. Nvidia hooked me up with a compatible system, and I streamed games like Borderlands 2 and Skyrim. There was minimal lag between what I was seeing on the PC and on the Shield and, again, performance was solid. But it wasn’t without faults. For example, when I moved to a room on the opposite side of my apartment from the router, my connection dropped. The PC-streaming feature is still in the testing phase, so hopefully Nvidia will resolve some of these issues soon. Nvidia estimates the Shield’s battery life at about 10 hours of casual gaming, five to six hours of intense gaming, and 15 hours of video playback. I didn’t do a formal battery test, but with a mix of about four hours playing casual games and three hours playing intense games, the Shield still had about 25 percent battery life at the end of the day. 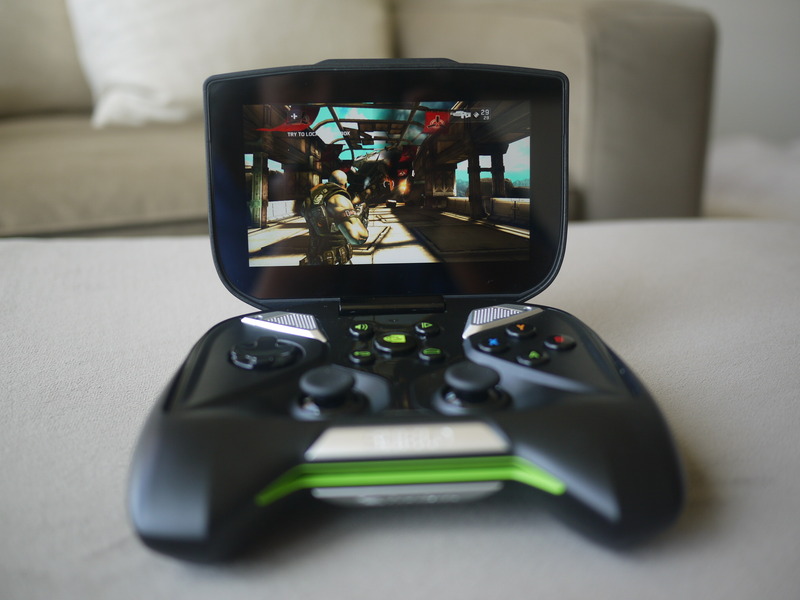 Nvidia has built a fun and powerful gaming handheld in the Shield, with lots of potential. But for now, it’s too expensive and needs more games.